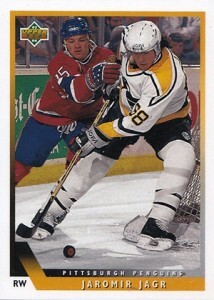 A lot can change in 25 years. 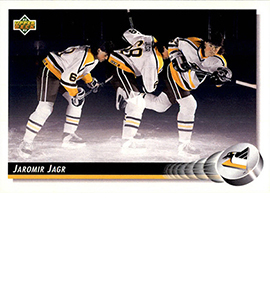 But when it comes to hockey cards, there has been one constant since 1990 -- the main Upper Deck Hockey set. 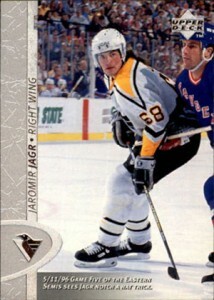 Along for the ride (except for a couple of years while he was taking a break from the NHL), has been Jaromir Jagr. 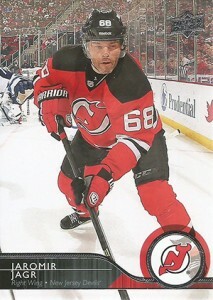 Just like the cards have evolved, so has Jagr's game. 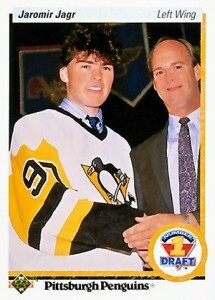 After the Penguins drafted him with the fifth overall pick in 1990, Jagr made the jump to the NHL immediately. 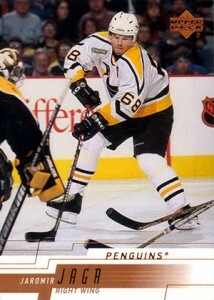 Joining Mario Lemieux, his long hair and knack for scoring helped Pittsburgh land both the 1991 and 1992 Stanley Cups. 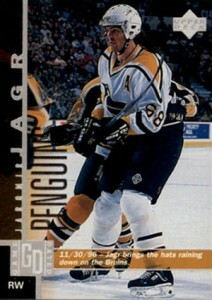 Jagr would continue to play with the Penguins and be an elite NHL scorer for a little over a decade. 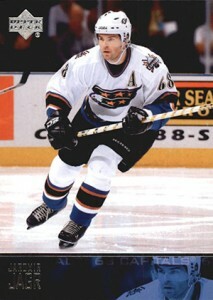 From there, fans watch Mr. Jagr go to Washington for a stint with the Capitals. 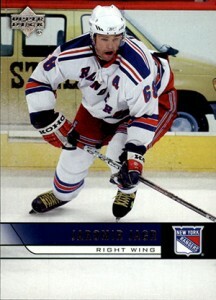 While still showing a knack for scoring, he didn't come close to same offensive success. 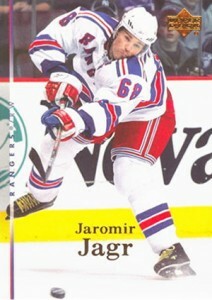 The Czech superstar was traded to the Rangers in 2003-04 and had a stellar 2005-06 season, notching 54 goals and 123 points -- his best since playing in Pittsburgh. 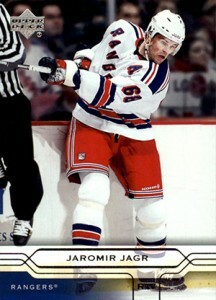 Since 2004-05, Jagr bounced around not only NHL teams, but various European clubs as well. 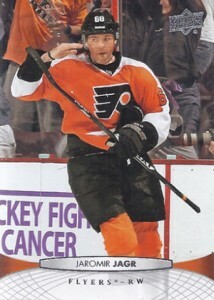 He didn't play in the NHL at all for three seasons before returning to play with the Flyers in 2010-11. 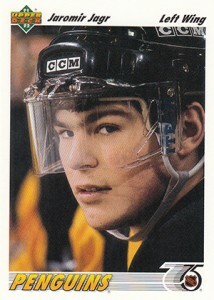 Since then, Jagr has also had stints with the Stars, Bruins, Devils and, now, Florida Panthers. 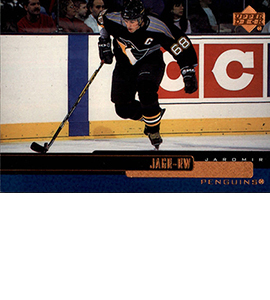 Jagr is the last active player from the inaugural 1990-91 Upper Deck Hockey release. 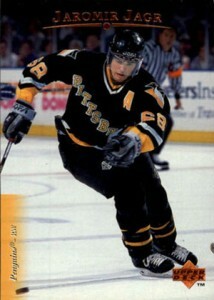 While he missed out on a couple of sets due to his NHL breaks, his timeline with the brand is a showcase for not only his playing career, but the brand's various designs through the years. 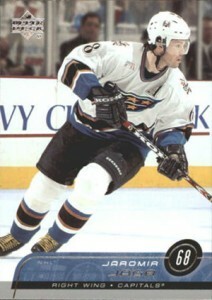 You can check out all of his his Upper Deck Hockey main cards in the gallery below. 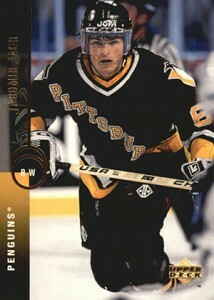 It only includes his main player cards and not inserts and subsets. 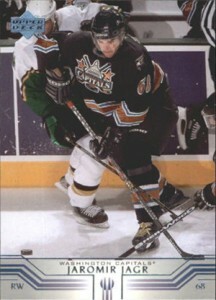 He was featured twice in 2001-02, the year he was traded to Washington. 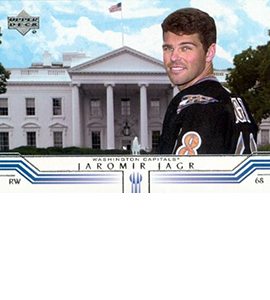 The first is a posed shot with him standing in front of the White House. 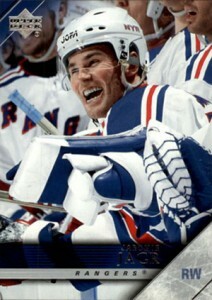 Upper Deck revisited the superstar with a more typical action shot. 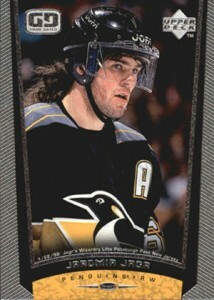 Jagr does not appear in the 2008-09, 2009-10, 2010-11 and 2012-13 Upper Deck Hockey sets. 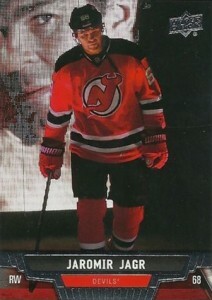 15-16 Upper Deck Overtime Wave 2 Red Parallel 99 - You Pick From List!